As Candace pointed out, October has become “Breast Cancer Awareness Month”. I also believe this is a bittersweet and confusing time for women who are trying to sort through the maze of information and misinformation out there: should I take hormones? how do I know whom to trust? Raising money towards a cure for breast cancer not only provides funding directed at a disease that primarily affects women(which in and of itself, is a step in the right direction) but the many activities and fundraisers occurring during this time also serve to bring people together, both for solace and a sense of community and empowerment . So this is the wonderful side of devoting a month to breast cancer awareness. This year I heard about an event that was new to me: Sail for the Cure, which actually started here in Portland 11 years ago. 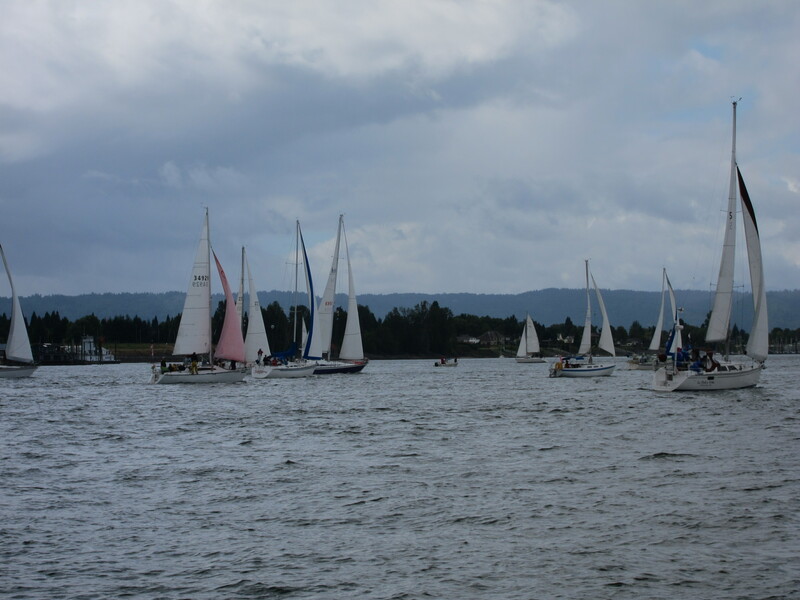 Over 75 boats gathered together for a regatta of sorts on the scenic Columbia River , each boat holding 7-10 participants who had raised money for the Komen foundation. My group included 2 of my friends, one husband and my 26 year old son, Conor. 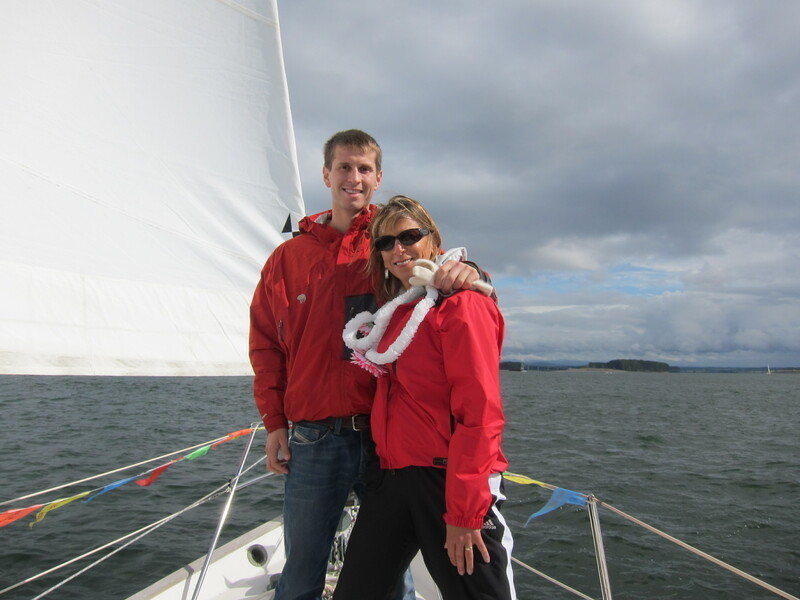 The rest of the crew was rounded out by 2 terrific women (sailing enthusiasts) plus the captain and her first mate. It was a beautiful fall day on the river, watching the graceful boats darting back and forth in a loose formation, sometimes dipping so low to one side but always managing to right oneself with ease. We bonded easily as a group, sharing snacks and beverages and random conversations, while sitting on the upper deck under the billowing sails. We managed to avoid a rather large and menacing storm off to the south and headed back to the yacht club in time for a buffet, some wine, a very fun raffle(I even won a sailing basket: what a great event) and goodbyes. All in all, a terrific day. New friends, new activity and a chance to raise money for an important cause. So I get it. There are many valuable aspects to the current focus on breast cancer and I appreciate what everyone is doing but I agree with Candace: by directing all of our funds towards screening and treatment , we are shifting our attention away from the actual prevention of breast cancer for millions(billions!!) of women. Let’s shift the paradigm a bit and include education about the ways women can feel empowered to reduce their individual risk for this disease that affects so many. We know that estrogen dominance is associated with many risks, including breast cancer. What exactly is estrogen dominance? In a nutshell, the normal physiologic balance of hormones changes to the point where the ratio of progesterone to estradiol(a pivotal estrogen)drops too low for a multitude of reasons: poor diet, age, exposure to chemicals in foods and the environment, lack of exercise, stress: there are many more. Here is a great link for more information: The Seventh Woman Foundation (scroll down to the section on estrogen dominance/progesterone deficiency and breast cancer). In addition, a low progesterone to estradiol ratio leads to many symptoms(you probably recognize a few! ): belly fat, anxiety, carbohydrate cravings, tender lumpy breasts, PMS, insomnia, low libido, mood swings, heavy periods: sound familiar? If this does, what should you do? Not so: don’t stop there. Keep going until you find a provider who knows about physiologic hormone balance and who insists on testing your levels. My mantra is “Test and treat, don’t guess and treat”. You deserve nothing less. Find out if you have estrogen dominance and take your first step in getting your hormones back in balance….and a great step towards helping to reduce your own risk of breast cancer. Back soon with more about hormone balance and how to find and maintain it.